Part of the comprehensive “Mission 66” program, more than 100 such centers were built thru the mid 60s. N&A designed two, one at Painted Desert in Arizona, and the second sited at the high water mark of the battlefield of Gettysburg, not 200 paces from where Lincoln stood when he gave his immortal ‘Gettysburg Address’. Neutra took this project to heart and gave it his all. It became one of the favorites of his long and distinguished career. One of his strokes of genius was his recognition to memorialize and commemorate the Gettysburg Address as importantly as any reference to the carnage and divisiveness of the Civil War battle that occurred here. His program to re-enact the ‘address’ annually from a ‘historic rostrum’ before thousands gathered outside and inside by broadly opening up the building, was inspired. Altho the project was initially well received and widely praised, the National Park service eventually failed to respond to this challenge and appointed superintendents who broadly ignored these provisions and often even disliked the building. By the early 90s a movement was started by the then superintendent to re-locate the cyclorama painting, thus obsoleting the building, and enabling him to campaign for its removal. 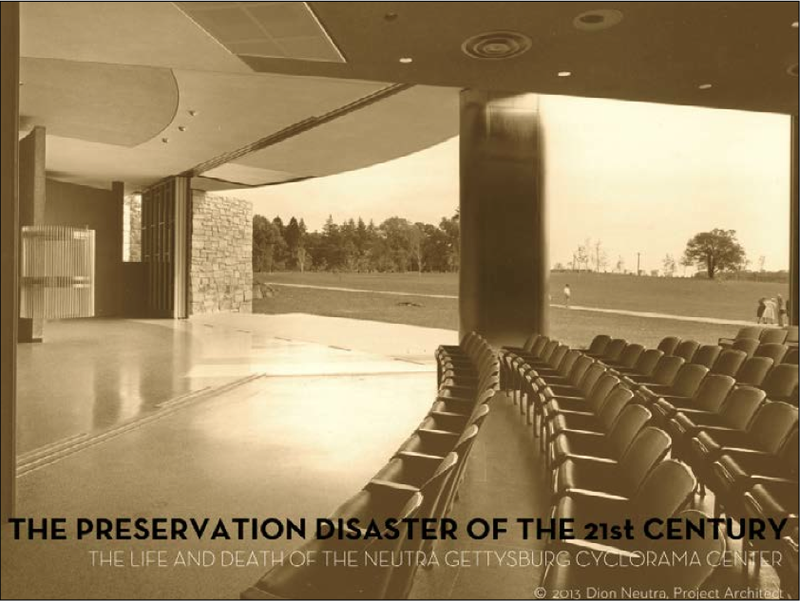 During this time Dion and others banded together to oppose this destructive plan to waste and fail to repurpose 35,000 sf of museum-like structure perfectly suited to become ‘The Abraham Lincoln Museum at Gettysburg’ and finally find its destiny to celebrate the 14th president and his immortal address. During this time, a lawsuit was filed calling the NPS to task for failing to consider alternatives to destruction. Efforts were made thru 3 presidential terms for a ‘pardon of a building’; a first in history. Over 4000 people signed petitions to this effect. No one could figure out how to reach any of the presidents from Clinton, to Bush, to Obama. In the end, despite the presence of some 1300 other monuments now standing around the battlefield, this particular one was singled out for removal ‘to make the area look like it did in 1863!’ Demolition was completed in March, 2013. This 200 page Monograph is the result of months of effort to assemble documents, photos and links to memorialize this remarkable building and the single worst act in the US, of institutional desecration in the 21st century. Can lessons be learned here, that could prevent a similar disaster being repeated yet again elsewhere? Dion has pointed out a few ideas in a special chapter in his new book series “The Neutras, Then & Later”. It is called ‘The State of Preservation in the US’. Perhaps we can finally fashion an effective National Policy for Preservation in our country, like other civilized Western Societies?